An online community publishing platform is helping authors find new audiences, even at the mall. 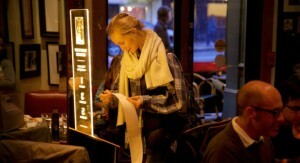 Arcades (Noisy-le-Grand, France) is serving up quick reads along with refreshments from its vending machines. The Klépierre shopping center is the latest in a rapidly growing list of high-traffic places to offer a literary work dispenser from Short Édition. In today's all-too familiar pandemonium of everyday life, free time is often a distant daydream. Reading? For many, that too seems far fetched. The French publishing company, Short Édition, has a solution — one that offers intellectual breaks of spontaneous prose combined with passion. It's known internationally as "The Short Story Dispenser," and it's inspiring a community of readers with more than 100,000 short stories by 9,000 authors from classic literary short works, such as Shakespeare and Virginia Woolf. "Stories elevate our lives," said Jennie Lay, adult programs coordinator for the Bud Werner Memorial Library. 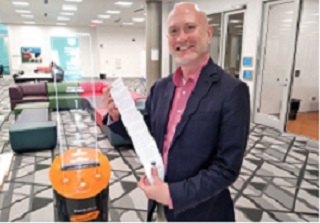 Three short story dispensers are now up and running at the Richland Library Main location at 1431 Assembly St.
Once upon a time there was a start-up with a dream of bringing the pleasures of reading to more people. Happily, this dream came true. At the push of a button the Short Story Dispenser prints out fiction that can be read in one, three or five minutes, for free. 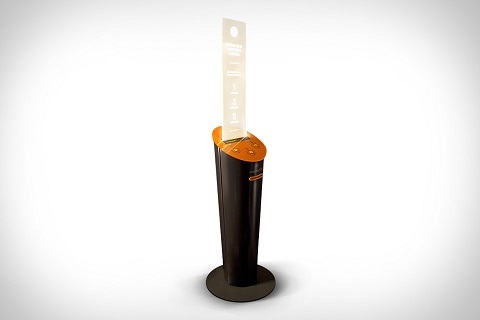 Ideal for spots where a wait is inevitable, the Short Edition Story Dispenser spits out short stories for free. Stories are shared many ways. They are recounted in books and magazines. They are read aloud around the campfire at night. They are randomly dispensed from stand-alone kiosks, doled out on strips of paper like grocery store receipts. Leave it to the French, with their love of Voltaire and Simone de Beauvoir, to revive literature in the era of hot takes, fast news and smartphone addiction. Patrons at the bar of Cafe Zoetrope in San Francisco have a diversion to help pass the minutes: They can read a story. It’s not a story on their phone or Kindle, or even an honest-to-goodness book, but a story they have printed out from a dedicated machine that stands in the bar. Short Edition is a French company which, having had success in its native country across 150 venues, turned its attention to U.S. shores. 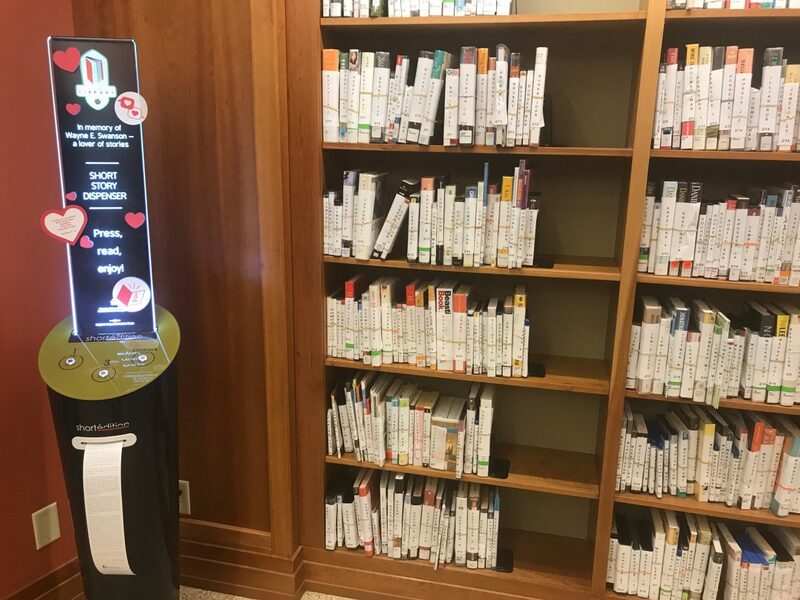 Akron-Summit County Public Library is one of four public libraries nationwide to offer Short Story Dispensers, or kiosks that dispense written works at the touch of a button. The Public Library Association, community publisher Short Edition and the John S. and James L. Knight Foundation partnered to offer this program to four select libraries in the United States. 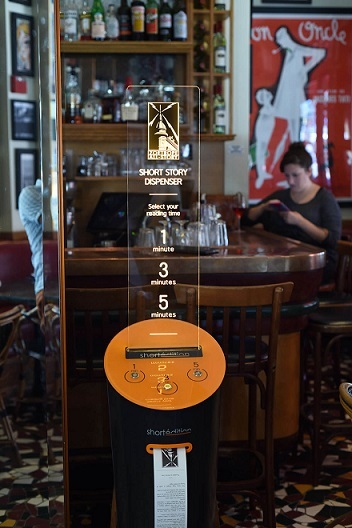 Thusly did filmmaker Coppola arrange for a free Short Edition story vending machine to be installed in Café Zoetrope, his San Francisco restaurant. The French-built machine is the perfect companion for solitary diners, freely dispensing tales on skinny, eco-friendly paper with the push of a button. A new French cultural phenomenon is spreading to the US. It’s not creamy cheese or baby-feeding crazes, but very short short stories, printed out on scrolls of paper and dispensed for free from vending machines.